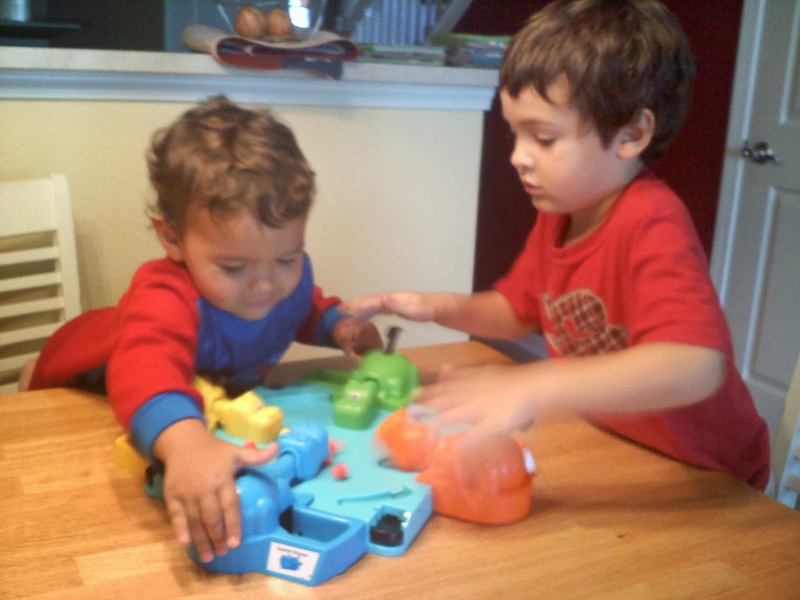 Boys had a busy week this week with friends! 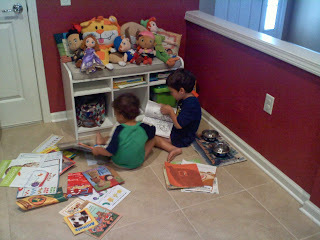 We had a playdate with their friend and Aunt on Tuesday and then we had cousins over for a sleepover party last night! 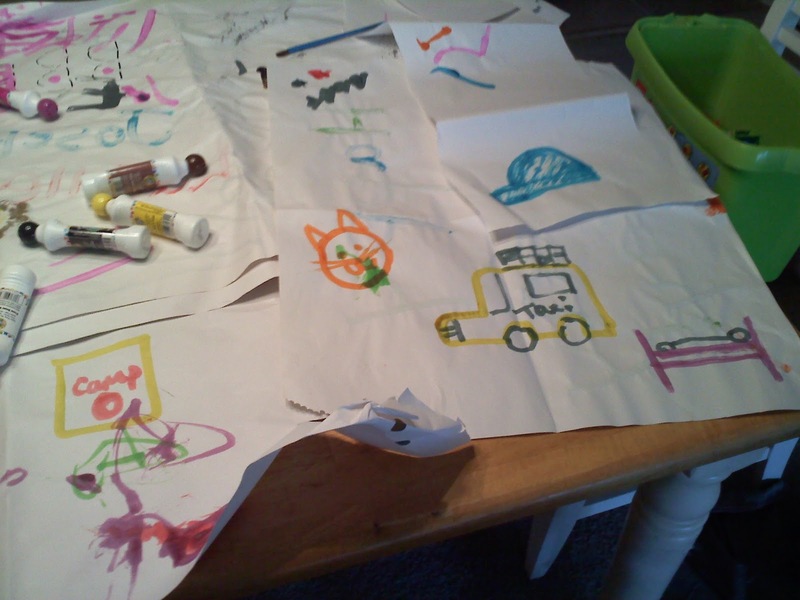 I noticed I haven't been posting every single thing we do because its all in my teacher's book the lessons plans we do for the week but I post the things that we had the most fun with! 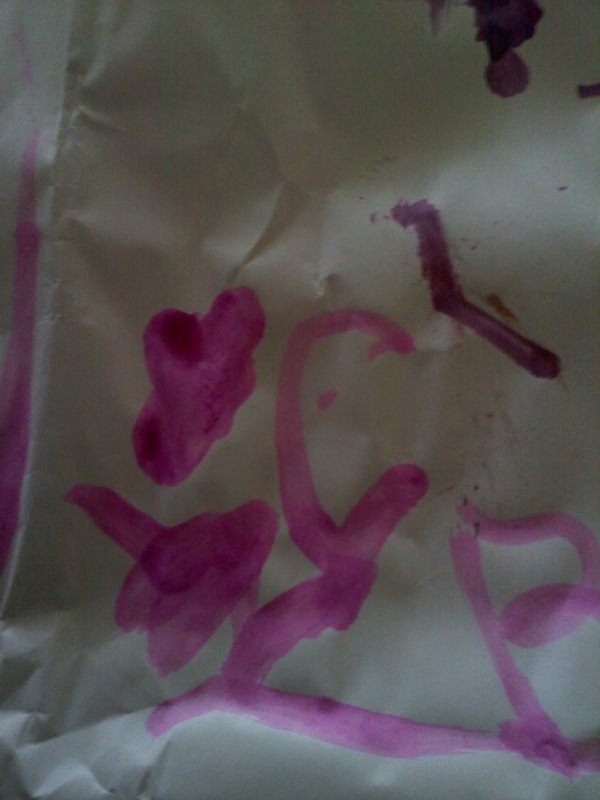 G is doing awesome with colors! 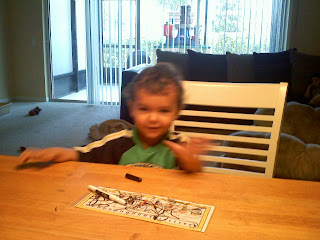 He picked out all the right answers on a Dora episode and for 2 1/2 years old, he impresses his Momma everyday! He worked with the color blocks and is also showing more interest in puzzles. Both the boys know how to count from 1 to 10 and B showed me he can count to 100 by 10's from playing ABCmouse with his cousin, so I am going to work more with him on this because that was awesome! 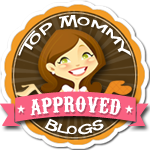 J is for Jack and the Beanstalk! 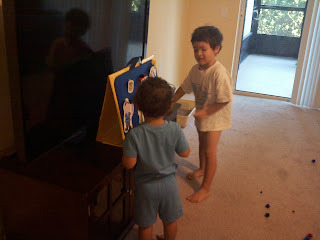 I found a cute printable from pre-kpages.com (http://www.pre-kpages.com/fairytales/) and laminated them and put some Velcro so they would stick on the flannel board and the boys decided to put on a play for me, just like that! 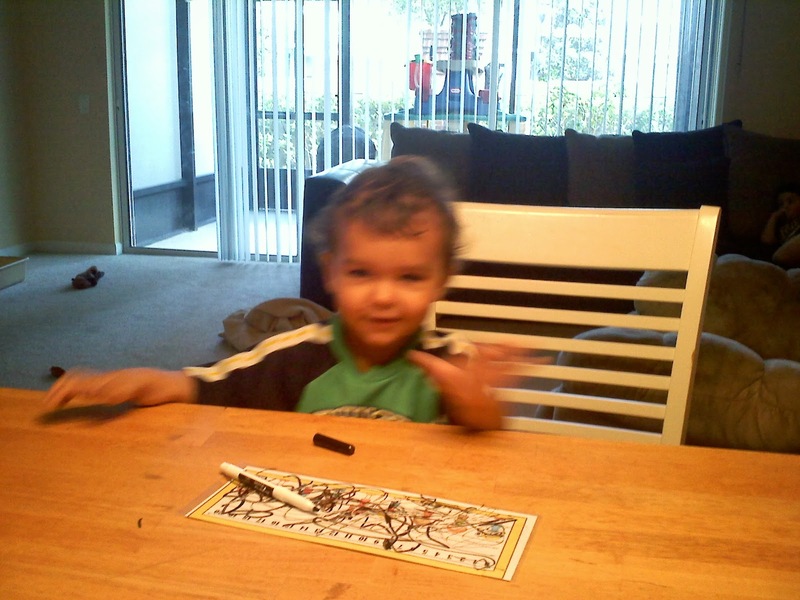 I recorded a video on my cell phone! 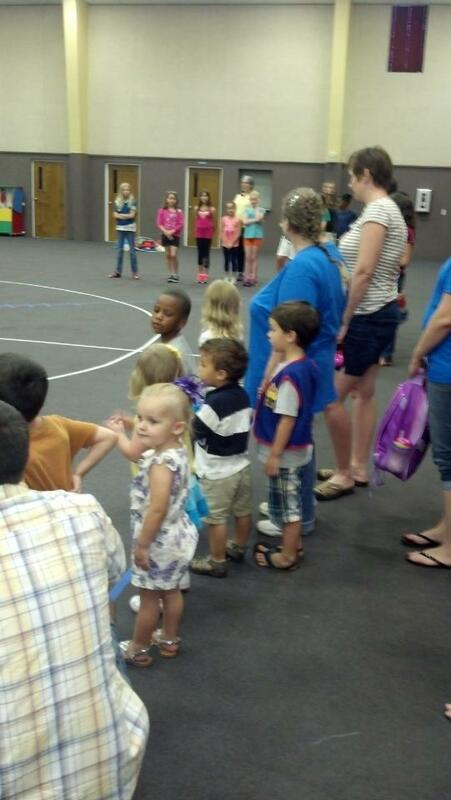 The children's ministry at our church has been putting on puppet shows for the them so they wanted Mommy to be the audience and put on their own puppet show! 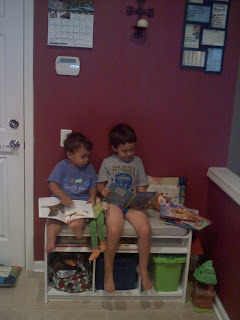 We read a cute Jack and the Beanstalk book by Nina Crews that we borrowed from the library! 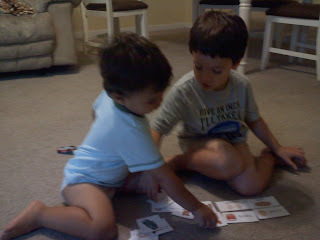 It was a very cute modern day telling of the story. They also got to watch video of Jack and the Beanstalk on YouTube. 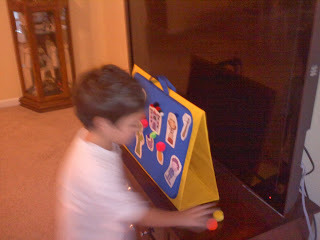 B playing with the "magic beans" and the characters in the play. 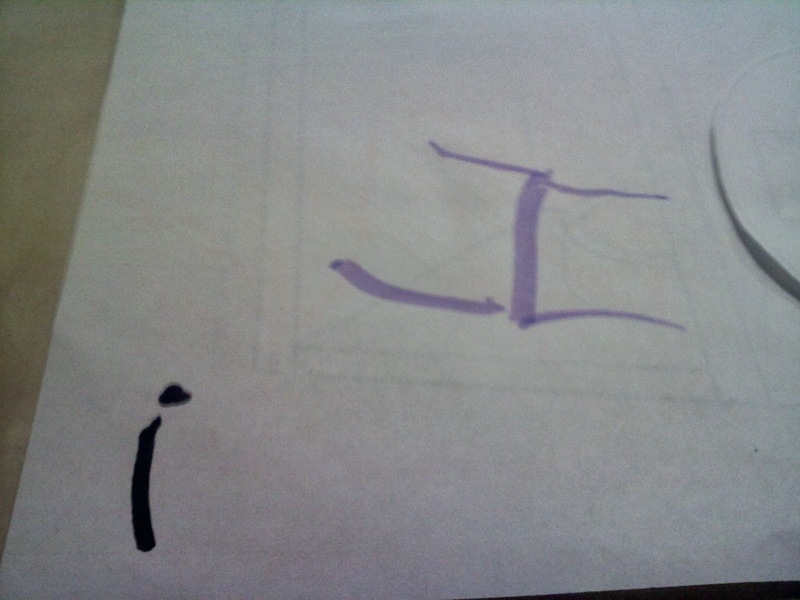 We made a I is for Insect booklet page with cut and paste and I asked B to write the letters on the back and look how perfect! No copywork needed; he just wrote it! 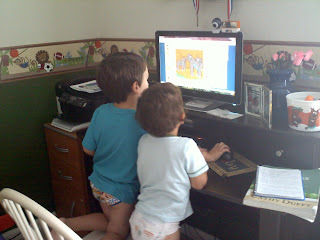 Daddy had a day off this week and helped B with lessons on ABCmouse and also with Awanas homework, which I loved! 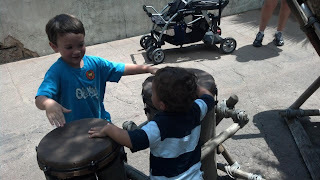 It is great that he is able to get involved with the boys and help them with their lessons also! We had a fun day outside (after 4 days straight of rain!) 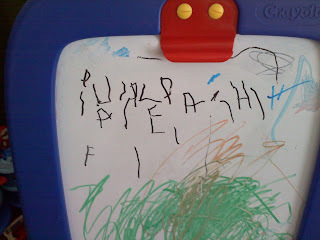 on Friday so we reviewed our letters with sidewalk chalk and played Hopscotch and counted from 1 to 10! 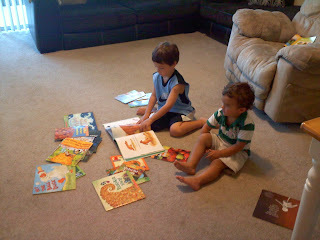 We also blew bubbles and took a walk and read lots of our library books! 3rd week of September: G is for Goat and H is for Hippo! 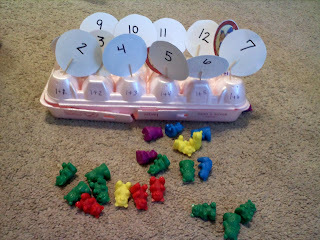 I saw a cool game on Pinterest (Great Math Idea!) practicing math by choosing the correct answer on a toothpick and then sticking it into the right equation. I got out the counting bears and showed the boys 1+1 and 1+2 up to 1+12 so they got to see that there are 12 eggs in a dozen and they had a blast sticking the toothpicks into the empty egg carton! We made a trip to the library so there were new books to read! Among them was, "The Three Billy Goats Gruff" and we learned about letter G this week and G is for Goat so we did a booklet called Goats Garage and there were cut and paste activities for the boys with the letter G on them. Little brother practicing his prewriting skills just like big brother! We went to Grandmas who let us borrow lots of fall themed books from her library so the boys and I have lots of reading for this week and next! H is for Hippo! What better way to learn about the letter H then to play Hungry Hippos! After the game, B was able to write a perfect H, no copywork needed! 2nd week of September - F is for Fall! 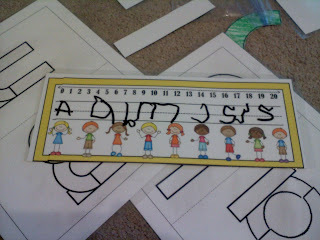 Some of B's writing skills at work! 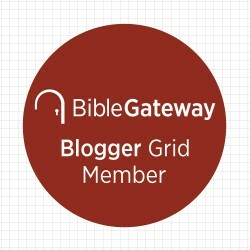 He is doing amazing! 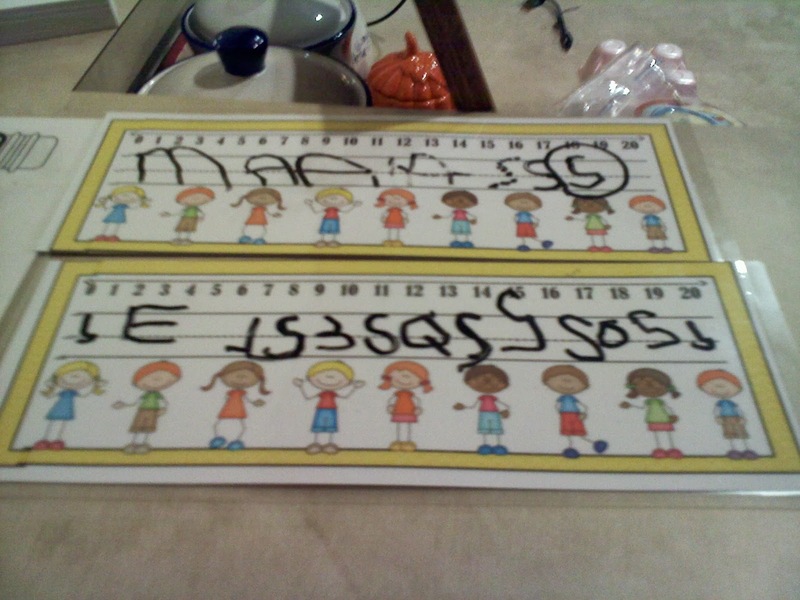 He actually went to his white board and did this by himself and then said, "Hey Mommy, look what I wrote!" 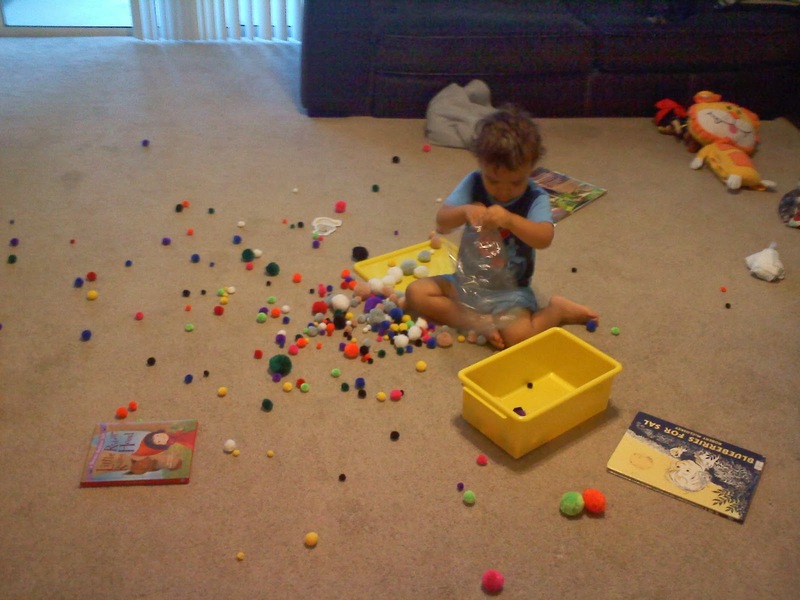 How awesome is it that he is wanting to do this without even being told? 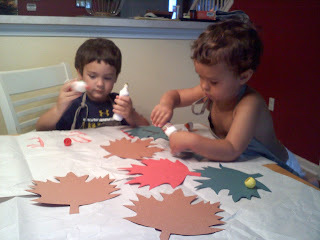 The boys had a blast painting the leaves first! 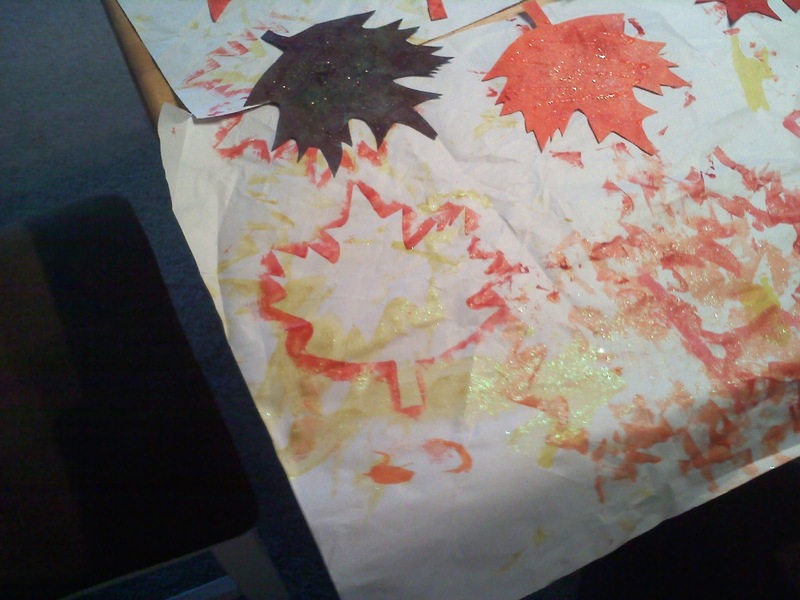 We painted the leaves first and then added the glue and glitter. I love how the paint made impressions of the leaves. I tried to explain to the boys how that really happens with real leaves but I am excited for them to see real leaves next month in Tennessee for their uncle's wedding. 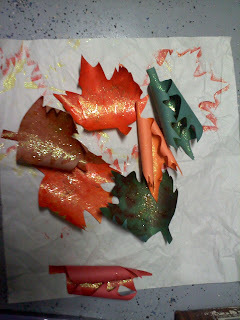 The cool thing is once we added the weight of the glitter and glue, the leaves actually curled up like real leaves! It made me miss seeing the colors change. 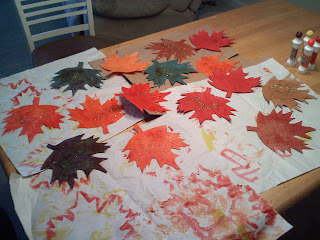 I explained to the boys after we were done, that God makes us all of us like leaves. Some of us have different or the same color but we were all created equally by the Lord and He made each of us special and unique just like their leaves. Not one is the same but all are special. 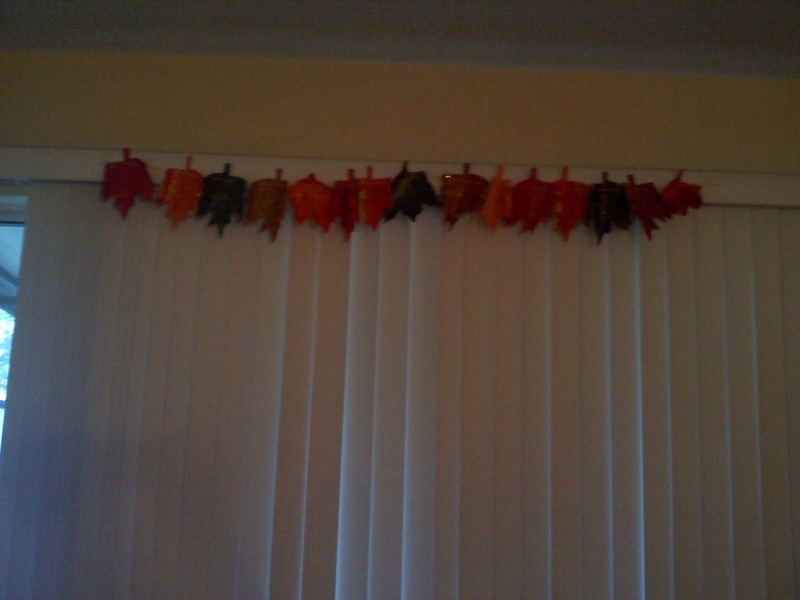 My husband had a great idea to put holes in the leaves and put string through the holes so we could hang them up like a garland! We saw beautiful fall garland at Disney recently but I love how ours turned out! 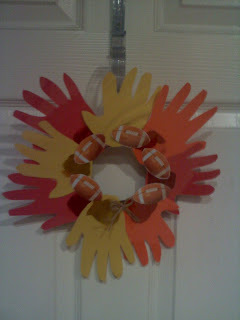 I saw a craft magazine with cute leaves and acorns on a wreath and again, I put my own spin on it! 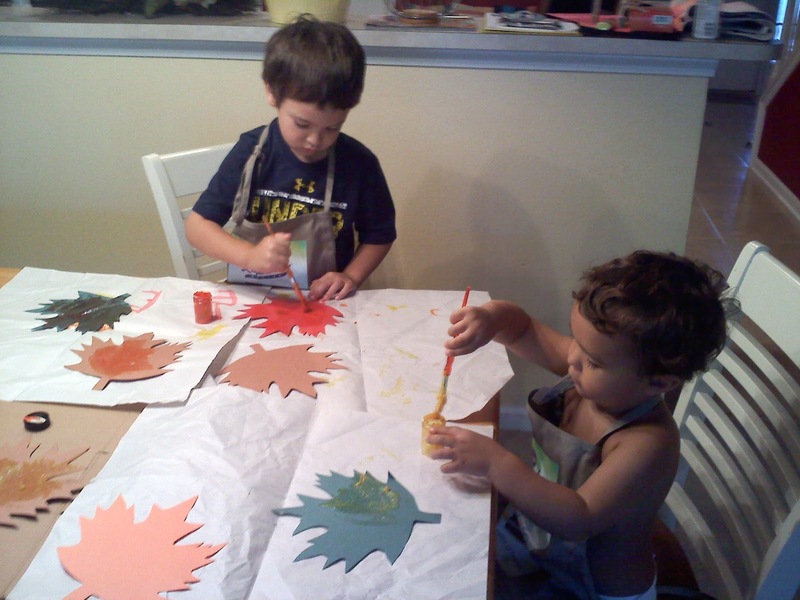 I traced around the boys hands and made "leaf" templates out of that and then laminated them. 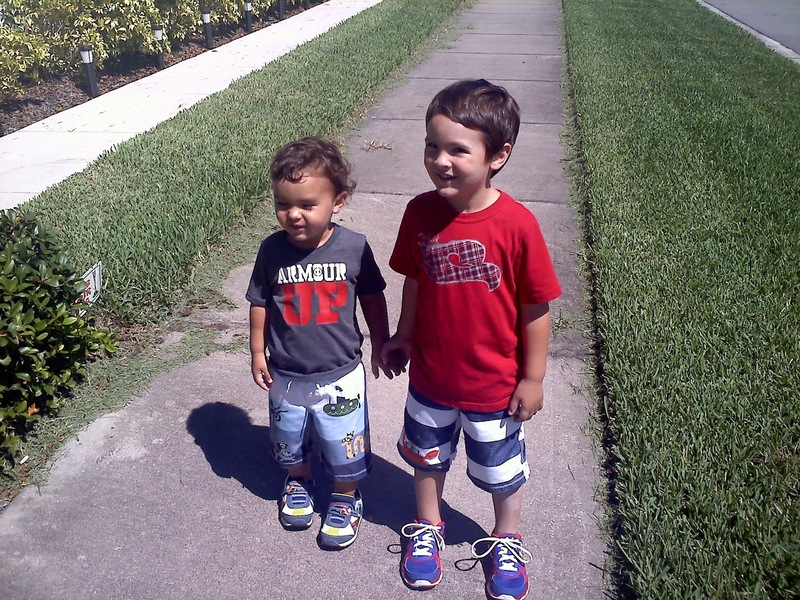 I think it is so special to have how small their hands are because I know one day, they will be bigger than my own! I then found a cute football template on ClipArt from Microsoft Word and laminated them because in this house, it is not fall without football! I also put a tiny bow made out of string from Uncle Adam and Alexis' bridal shower so it is a very special wreath I could never find in a store! 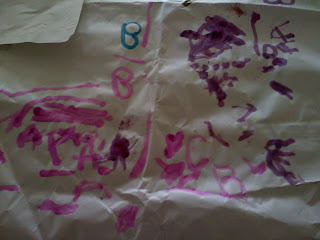 Again, here is B with his writing! Absolutely amazing! 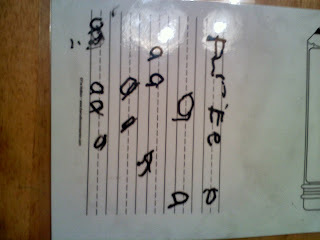 Yesterday, he even wrote out "am," which is from the lessons we are doing for his reading. My sweet boys out for a nature walk and headed to the pool after classroom work! I was in high school when 9/11 happened. I remember seeing it in on our morning show on the TV and all of us just thinking that is a sick joke, thinking that someone was playing around with the audio equipment because it was just a quick glimpse and then it went back to the morning show. I was walking into third period and opening the door as the second plane crashed into the WTC. I immediately fell to my knees, realizing that this was not a joke but very, VERY real. I was a TA for one of the coaches and he and another one of my teacher's was in there watching the news on the TV just in disbelief. I will never forget what my teacher said: "Hold your loved ones extra tight tonight." My husband and I were dating at this point in high school and we found each other and I just remember being terrified. We didn't know if this would start a war or have him be drafted as we had heard so many stories about WWI and WWII and young men being drafted and sent off. We didn't even know what and if tomorrow would be bring. I remember not being able to reach my Dad on his cell phone because he lives up north and all the cell phones were so busy that you couldn't reach anyone. I remember friends and classmates who had family and friends who lived up north that they could also not reach and later on finding out, that some of them passed from the attacks. It's been 12 years now since that happened and I still remember it like it was yesterday. I went on to graduate high school and college. I became a wife and a mother; two things I am so incredibly grateful to God and to the military for. I pray for the families that lost someone special that day. Today we honor and remember all the lives lost; to all the people just going to school or work that day and to all the heroes who risked their lives to save others. I truly respect all these heroes and military who continually fight for our freedom. 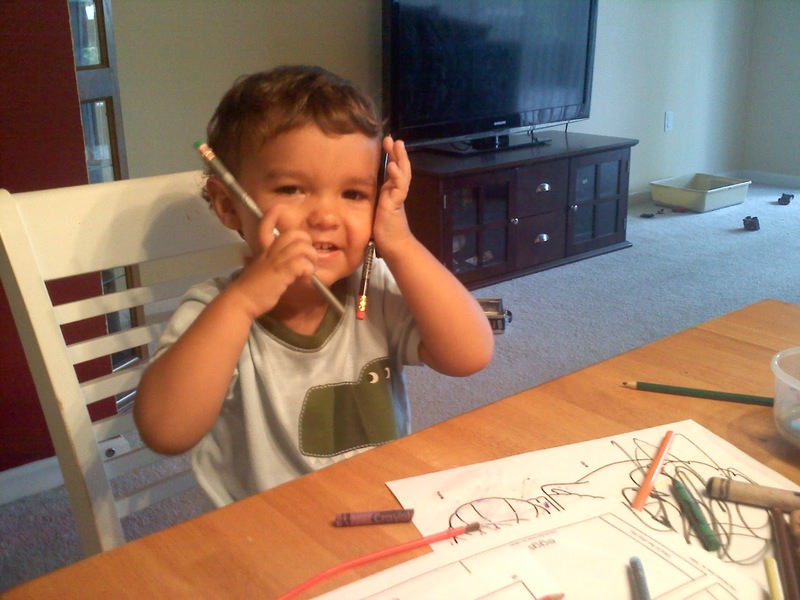 G coloring his elephant booklet! B loves using the glue sticks and his scissors! He did a great job learning how to cut in a straight line and helped his brother with his booklet when he was done! 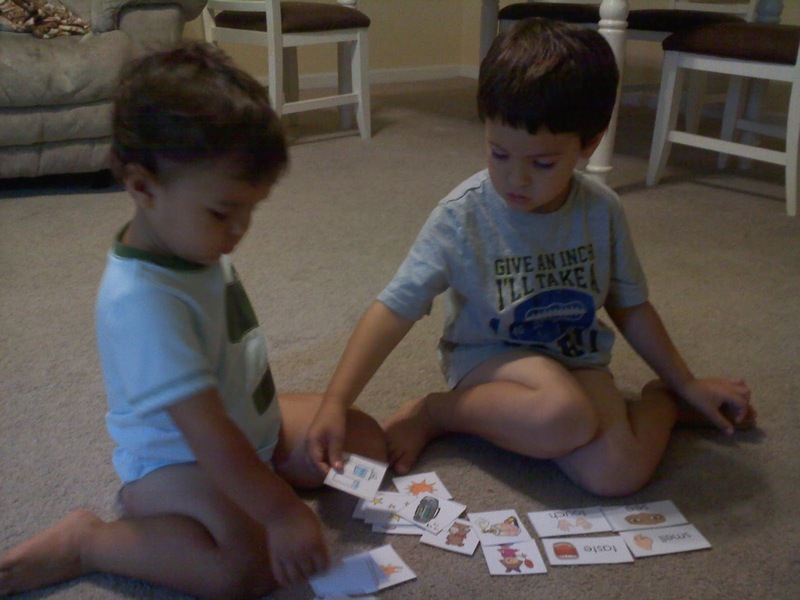 The boys learning their Five Senses. 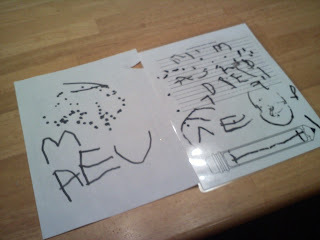 B practicing his writing skills again! He is also doing lessons from 100 Easy Lessons so he is getting ready to read and write! 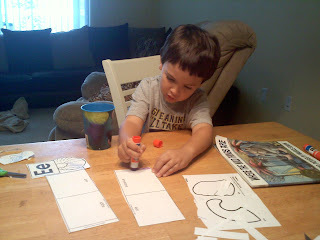 I found this awesome build letter template on Pinterest and it is helping him figure out how to put the letters together. 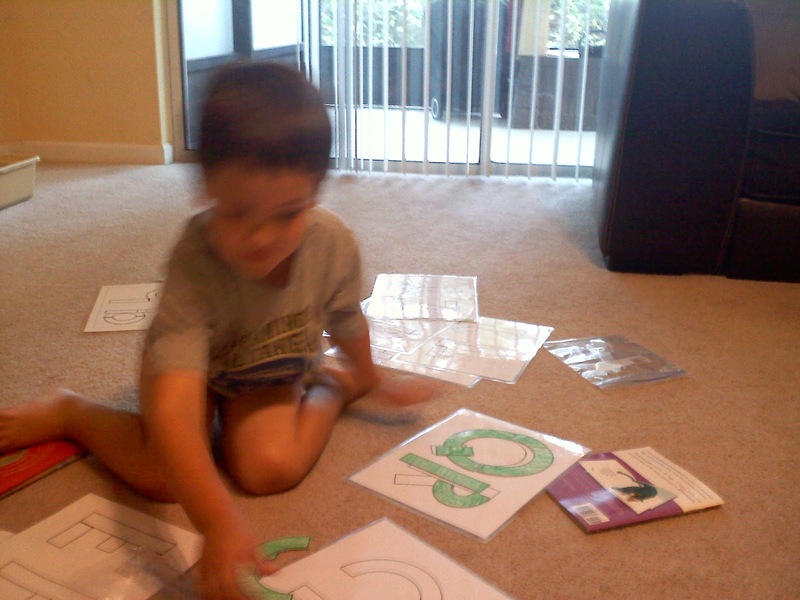 He is really good at puzzles so this is making it more easy for him to understand how to write the letters. 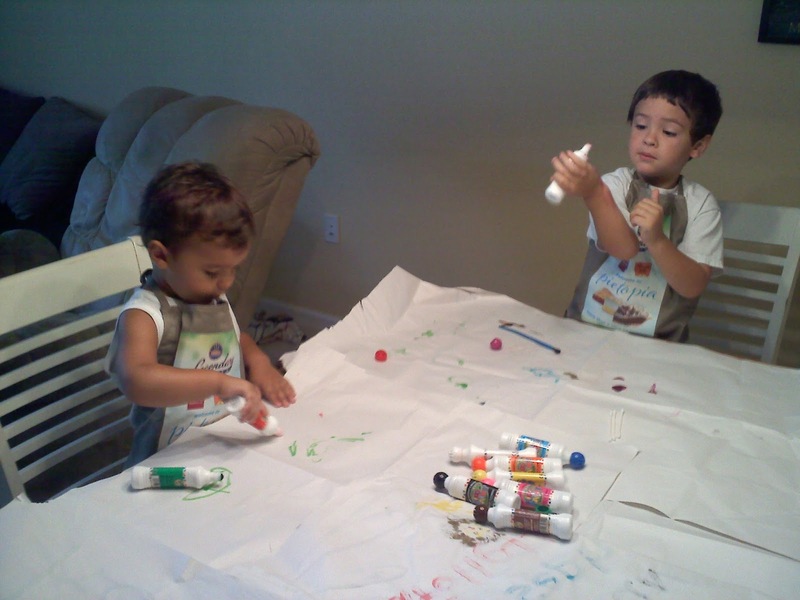 Painting with the new art smocks from Grandpa's restaurant! This is great for helping G with his colors and Evan practicing his writing skills! 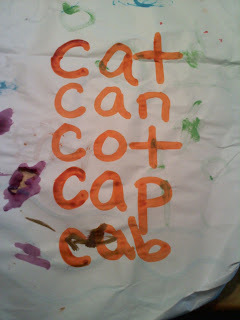 We learned about the letter "C" today so these are some "C' words from out Leap Frog Sight Words set. Doing a review on all the letters we have learned so far! 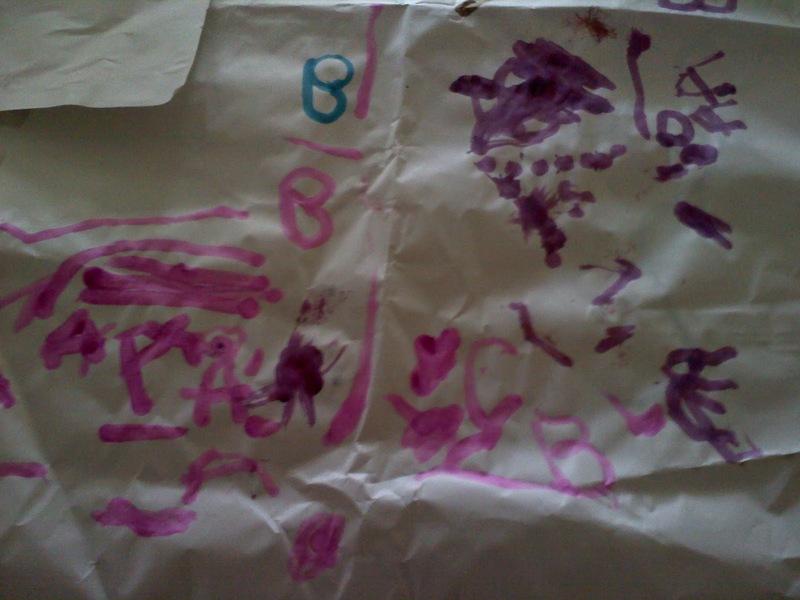 B and I struggled one day with the letter "B." We were both so frustrated with each other but then I went to a homeschool meeting and one of the speakers said, "It's okay if they don't write a perfect "A" when they are little; it's just best for them to learn through fun." I'm thinking to myself okay, it was the letter "B" but I got the point. 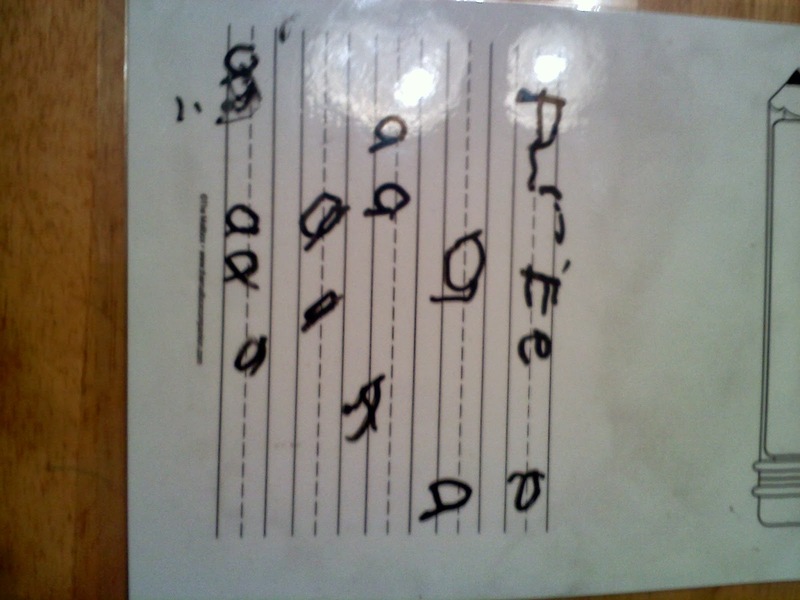 It's best to let them figure it out when they are ready and the very next day he wrote a perfect "C' with no copywork or being told how! This was a birthday gift from both my sisters! It is the perfect bench for our nook in the kitchen and the boys love having their own "cubbies" to store some of their toys, books and learning activities for the week. 1st day of Awanas! They are both in the same class! G is a Puggle and B is a Cubbie! 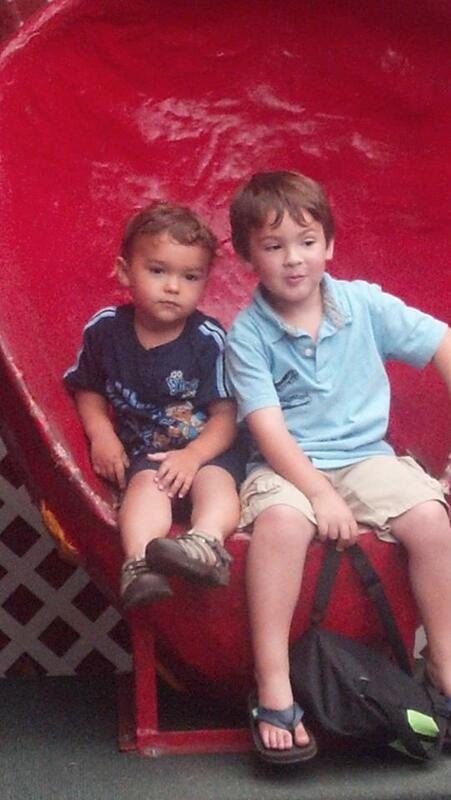 My handsome boys at one of our favorite ice cream spots! Learning how to play the drums at Animal Kingdom! 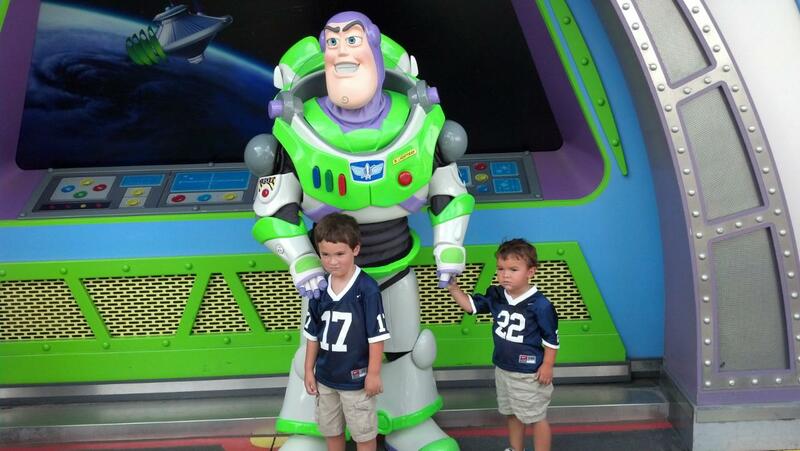 Meeting Buzz Lightyear in both their Penn State jerseys! Daddy and Grandma were very proud that day!